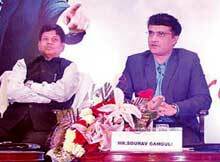 Sourav Ganguly was in Bhubaneswar to deliver a motivational talk organised by leading Odia daily ‘Sambad’ to mark the 30th year of its publication on Saturday. Building trust, instilling belief in team mates and an ability to adjust are the three qualities a leader needs whether it is in the field of cricket or elsewhere, said iconic cricketer turned commentator Sourav Ganguly. Former captain of Indian cricket team reminisced his connections with Barabati Stadium in Cuttack before making his international debut. “We used to put up at Barabati stadium’s dormitory when we used to play Ranji Trophy matches in this stadium. When I was in Cuttack last year, I sneaked into the dormitory to recall the yesteryear memories. I noticed that it’s all the same now,” Sourav reminisced with a chuckle. He also recalled his association with first international cricketer from Odisha Debasish Mohanty and said he shared many lighter moments with Mohanty off the field. Successful handling of pressure situations is a hallmark of a great leader. If you treat pressure as an opportunity, then you become successful. Every situation is a challenge in life, he shared. Sourav Ganguly said he was hopeful of a good performance from the current squad in the upcoming World Cup.